2006 reissue, 2CDs including the original remastered ambient classic, with a bonus disc, the entire album performed by Oregon's Dreams in Exile. River was a high point of Obmana's early compositional style, presenting a minimal and serene flow utilizing sparse piano lines which intermingle with drifting keyboard loops and organic rainstick sounds. There is an overall harmonic unity on these 8 pieces, stripping dense walls back to reveal a slowly changing sound configuration. The 2nd disc is not merely bonus tracks, but a complete re-creation of the original on traditional instruments. 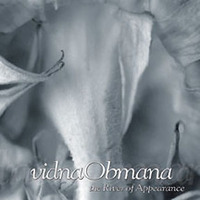 Re-experience the everlasting melancholy of the River of Appearance on this exceptional 10th anniversary 2-cd release. The favorite of many vidnaObmana fans, pleasantly long & slow-moving like much of his earlier work, but with a slightly more musical feel. "This is surely a hyper-minimalism of sound, one that reflects the great inner serenity of this musician." "Well-known ambient composer Vidna Obmana returns with a new set of ethereal synthscapes, some of his most enchanting and well-crafted to date."